A gas in its normal state is almost a perfect insulator. However, when a high voltage is applied between the two electrodes immersed in a gaseous medium, the gas becomes a conductor and an electrical breakdown occurs.The processes that are primarily responsible for the breakdown of a gas are ionization by collision, photo-ionization, and the secondary ionization processes. In insulating gases (also called electron-attaching gases) the process of attachment also plays an important role. where, A is the atom, A+ is the positive ion and e– is the electron. A few of the electrons produced at the cathode by some external means, say by ultra-violet light falling on the cathode, ionize neutral gas particles producing positive ions and additional electrons. The additional electrons, then, themselves make ‘ionizing collisions‘ and thus the process repeats itself. This represents an increase in the electron current, since the number of electrons reaching the anode per unit time is greater than those liberated at the cathode. In addition, the positive ions also reach the cathode and on bombardment on the cathode give rise to secondary electrons. The phenomena associated with Ionization Processes by radiation, or photoionization, involves the interaction of radiation with matter. Photoionization occurs when the amount of radiation energy absorbed by an atom or molecule exceeds its ionization potential. continuous absorption by direct excitation of the atom or dissociation of diatomic molecule or direct ionization etc. where Vi is in electron volts (eV). The higher the ionization energy, the shorter will be the wavelength of the radiation capable of causing ionization. It was observed experimentally that a radiation having a wavelength of 1250 A is capable of causing photo-ionization of almost all gases. A positive ion approaching a metallic cathode can cause emission of electrons from the cathode by giving up its kinetic energy on impact. If the total energy of the positive ion, namely, the sum of its kinetic energy and the ionization energy, is greater than twice the work function of the metal, then one electron will be ejected and a second electron will neutralise the ion. The probability of this process is measured as γi which is called the Townsend’s secondary ionization coefficient due to positive ions and is defined as the net yield of electrons per incident positive ion. γi increases with ion velocity and depends on the kind of gas and electrode material used. is known as the threshold frequency. For a clean nickel surface with φ = 4.5 eV, the threshold frequency will be that corresponding to a wavelength λ = 2755 A. If the incident radiation has a greater frequency than the threshold frequency, then the excess energy goes partly as the kinetic energy of the emitted electron and partly to heat the surface of the electrode. 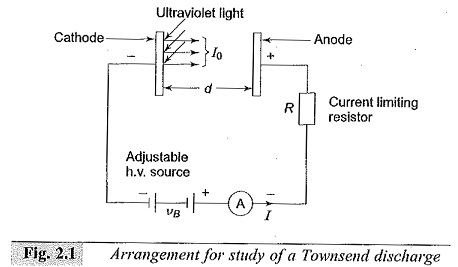 Since φ is typically a few electrons volts, the threshold frequency lies in the far ultraviolet region of the electromagnetic radiation spectrum. A metastable atom or molecule is an excited particle whose lifetime is very large (10-3 s) compared to the lifetime of an ordinary particle (10-8 s). Electrons can be ejected from the metal surface by the impact of excited (metastable) atoms, provided that their total energy is sufficient to overcome the work function. This process is most easily observed with metastable atoms, because the lifetime of other excited states is too short for them to reach the cathode and cause electron emission, unless they originate very near to the cathode surface. Therefore, the yields can also be large nearly 100%, for the interactions of excited He atom with a clean surface of molybdenum, nickel or magnesium. Neutral atoms in the ground state also give rise to secondary electron emission if their kinetic energy is high (≈ 1000 eV). At low energies the yield is considerably less.